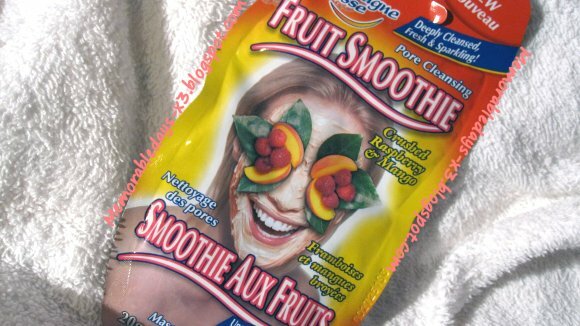 Montagne Jeunesse: Fruit smoothie mask review | Memorable Days : Beauty Blog - Korean Beauty, European, American Product Reviews. I bought a few mask from Montagne Jeunesse the other day: http://memorabledays-x3.blogspot.com/2010/11/new-mask-from-montagne-jeunesse.html I was curious about their newest mask so I tried that one first. Fruit Smoothie - with Crushed Raspberry and Mango. It's for normal, dry and T-zone skin. Price: The mask is around €1,80. I bought it for €1.-, since it was on sale at a Dutch drugstore. Wash your face first, pat it dry and follow the instructions which is written on the back of the packaging: "Apply the mask evenly with your fingertips on your face and neck, avoid your eyes and lips. Lie back and relax for 10-15 minutes or until it's dry and rinse it off with warm water. Pat it dry and you're done. Use it weekly." You can also use a brush if you want to. It has a nice and sweet scent of raspberry, mango and other kinds of fruit, but the scent of raspberry is stronger than the other fruits. I don't recommend this mask if you don't like the smell of raspberry. The texture is creamy/ smooth, so its very easy to apply. I'm not sure if you can see the color of the mask clearly on the picture. The mask is a little bit light pink, so its not similar to the color which is on the package. The mask on the model has a light yellow tone. There's a lot inside it so you can apply a thick layer if you want to. It took me around 25 minutes till it was all dry. I applied everything which was in the package, so I had a thick layer on my face. That's why it took longer than 15 minutes. I took a picture after 2, 12 and 25 minutes. You can see that its drying, the mask will turn white and it gets hard. The mask is easy to apply, I liked the scent of the mask, it smells a bit like candy, I almost wanted to eat it up hahah ^o^ My skin did feel soft and fresh after I washed the mask off, so it does do what it promises. 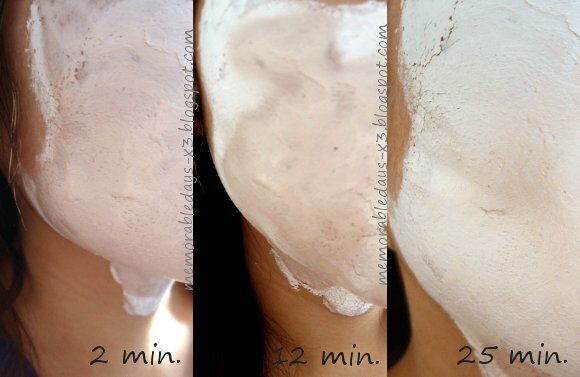 It promises to clean the face deeply and the pores on your face as well. However, it didn't clean all of my pores, especially not on my nose, but it did clean my pores around my mouth and cheeks. I think it's a pity that the color of the mask isn't the same as on the package. I like the pink color though, but I do think they need to change it. @insideout elle, thank you ^__^!